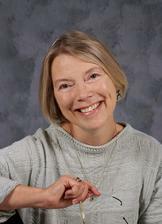 Jeanne Matthews was born and raised in Georgia, where owning a gun is required by law in certain places and “he needed killing” is a valid legal defense to homicide. Jeanne’s debut novel, Bones of Contention, published in June 2010 by Poisoned Pen Press, features a conniving Georgia clan plopped down in the wilds of Northern Australia where death adders, assassin spiders, man-eating crocs, Aboriginal myths, and murder abound. Jeanne currently resides in Renton, Washington with her husband, Sidney DeLong, who is a law professor, and their West Highland terrier. 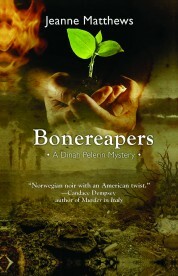 Her second novel, Bet Your Bones, and the third, Bonereapers, are available at bookstores everywhere. Jeanne is here today with the fascinating tale of the first real female detective. The Pinkerton Detective Agency has employed a number of great detectives since it was founded in 1850. To name just a few, there was Frank Geyer, who in 1895 tracked down the first known serial killer in the U. S. Dashiell Hammett is probably the most famous of the Pinkerton operatives. He turned his real-life experiences investigating criminals into a collection of gritty, hard-boiled detective stories that continue to enthrall readers. And in the 1940s, my father, Joel Matthews, was a Pinkerton op. He traveled undercover through the South on a dangerous assignment to identify and expose a ring of thieves who preyed on one of the agency’s top clients. But family loyalty aside, I have to admit that the most extraordinary Pink was Kate Warne, the first female detective. ad. “Women,” she told Allan Pinkerton, “could be most useful in worming out secrets.” She observed that men tended to become boastful when encouraged by an attractive woman and Kate was undeniably attractive. Impressed by her audacity and smitten by her slender figure and “beguiling” manner, Pinkerton hired her on the spot against the strong objections of his brother and partner, Robert. Not much has been written about the prejudice Kate must have encountered, but she began to prove her worth immediately. She was a keen observer and adept at establishing friendly relations with strangers and insinuating herself into their confidence. Assigned to a major embezzlement case, she ingratiated herself with the wife of the prime suspect and “wormed out” enough evidence to convict him. She was more effective than her male counterparts at talking her way into social gatherings, flirting and charming men into revealing all sorts of guilty secrets. Posing as a rich Southern belle with a thick-as-grits drawl, she infiltrated a secessionist shindig in Baltimore and learned significant details about a plot to assassinate Abraham Lincoln. Later, she helped smuggle Lincoln by train from Philadelphia to Washington, wrapped in her shawl and disguised as her invalid brother. 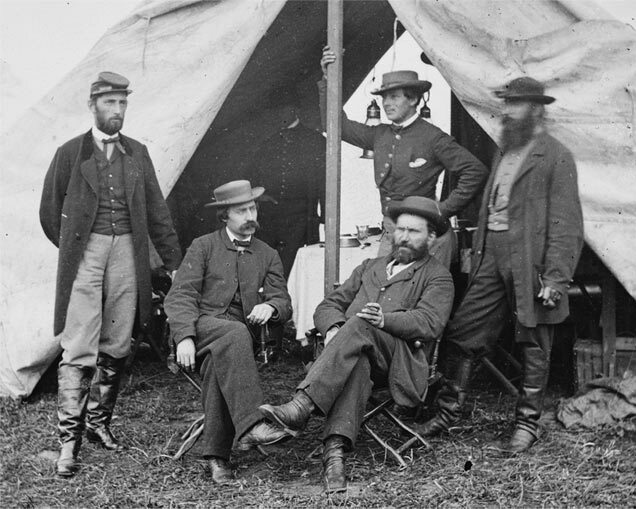 In his memoir, Allan Pinkerton claimed that he could never have saved the life of the sixteenth president without the first female detective, Mrs. Kate Warne, at his side. During their many investigations, and notwithstanding the fact that he was married, Allan and Kate traveled across the country together, frequently posing as a married couple. There is little doubt that she became his mistress. The Pinkerton Agency logo was “The Eye That Never Sleeps,” but whether or not they actually slept, the boss “eye” wasn’t above taking his trusted assistant to bed. In addition to carrying out several spy missions for the Union during the Civil War, Kate worked on many high-profile cases. She went undercover to catch a murderer and discovered the location of his stash of stolen money. She assumed the persona of a fortune-teller to foil a poisoning. And she persuaded Pinkerton to establish an all-female investigative bureau within the agency. She trained the other female detectives and supervised their case work while participating in covert investigations conducted by Allan and fending off the continuing objections of his brother. Kate died suddenly of pneumonia in 1868, thirty-seven years before Lola Baldwin was sworn in as the nation’s first official female police detective in Portland, Oregon, and fifty-two years before women won the right to vote. Allan had Kate buried in the Pinkerton family cemetery in Chicago. He lived on until 1884, when he slipped on a sidewalk and bit his tongue, resulting in a fatal case of gangrene. He was laid to rest between his wife and his mistress. I have read that USA Network is developing a TV drama about Kate. If they capture even half the excitement of her life, it should be a terrific series. 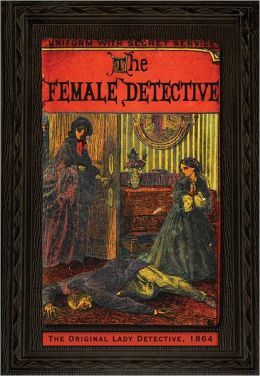 And for those of you with a yen for firsts, Andrew Forrester’s The Female Detective is back in print after 150 years, thanks to the British Library. When the book was published in 1864, there were no official female police officers or detectives in Britain. Forrester’s fictional female sleuth, Miss Gladden, was a pioneering character and as Alexander McCall Smith notes in the foreword, the book is “the beginning of a rich and continuing tradition in crime literature of the female detective.” But in the world of real crime and real women, the pioneering credit belongs to Kate Warne, the woman who put the “pink” in Pinkerton. Great post. I was the first female officer for our department. Now I know who the real trailblazer is!